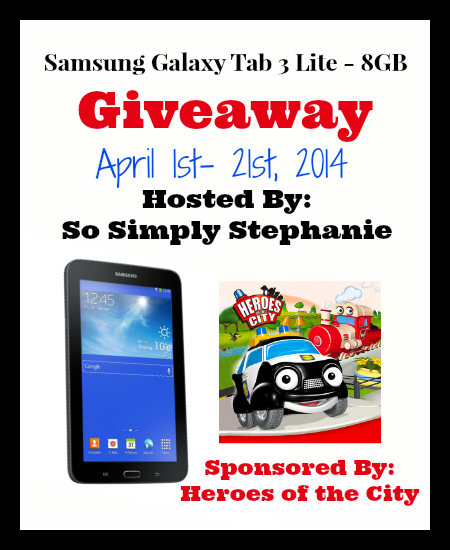 Welcome to the Samsung Galaxy Tab 3 Giveaway! A special thanks to Ruda Ett DVD AB Publications, the creators of the Heroes of the City Kids App, for their generosity in sponsoring this event! 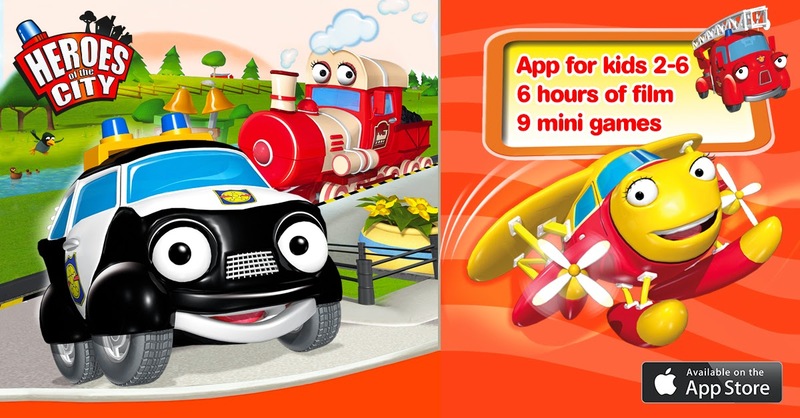 An all-in-one, safe and fun children's application.This is a perfect app for children 2-6 year. The app includes more than six hours of entertaining movies and nine exciting games!The content is fully adapted to the target audience and is based on the popular television series Heroes of the City. More than six hours of entertaining movies! Air Play function for your Apple TV! Collect trophies to unlock your own secret surprise! One full movie episode, 3 games and a music video for free. Give your children their first contact with a new language; it is possible to switch between multiple languages. The app includes English, Swedish, Russian, Polish, Thai, Korean, Dutch, Italian, Czech and Hungarian languages. Also be sure to check out So Simply Stephanie's Heroes of the City App Review . Download the Heroes of the City App for FREE! Plus, receive additional entries into the giveaway when you post your review! Please use hashtag #HotCSTG in your review. RULES/DISCLOSURE: Void where prohibited. Must be of legal age to enter. This blog did not receive compensation to participate in this giveaway. Ruda Ett DVD AB Publications will be responsible for prize fulfillment and shipment. A single winner will be randomly chosen via the Rafflecopter widget and notified via email. The winner will have 48 hours to respond to the notification with their shipping address or a new winner will be chosen. Winner's information will be shared with Ruda Ett DVD AB Publications for the purpose of prize shipment. The winner will also be announced on SoSimplyStephanie.com. Facebook, Twitter, Pinterest, and other social media outlets and website platforms are not associated with this giveaway, do not endorse and are not responsible for this giveaway in anyway. Downloading and reviewing this app is not required to win, but greatly appreciated. If you have any questions please feel free to contact Stephanie at sosimplystephanie@gmail.com. I downloaded it on google play. Gave it to my 4 year old to play and he liked it also. Great music too! I don't have an iphone so I couldn't download it. I'm sure my kids would LOVE it! A Fantastic New Look from Rockaboo Designs! Rewind to You: Cover Reveal and Giveaway!